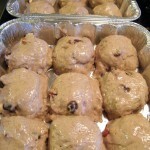 Using very wet or oiled hands, divide mix into 24 smooth balls of dough (about 3 Tablespoons dough per ball). 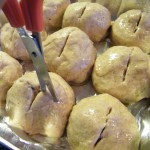 Place dough balls evenly spaced onto a baking sheet lined with Silpat or parchment paper. Cover with oiled plastic wrap and allow to raise for about 45 min to an hour until almost doubled in size. 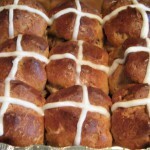 Gently brush buns with egg wash. With oiled scissors, snip a cross shape ¼″ deep into each bun. **Bake buns in a preheated 375 degree oven for 30 to 35 minutes. Allow buns to cool on a cooling rack. 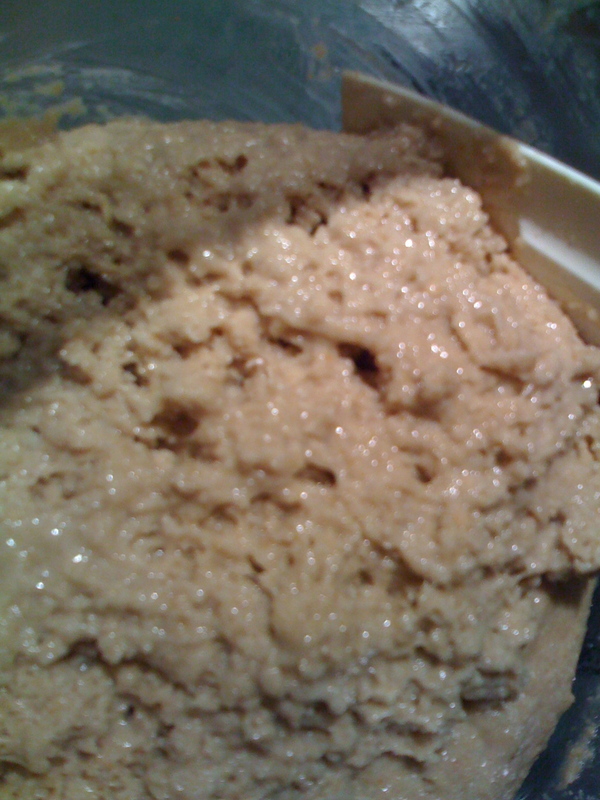 Mix icing ingredients together until smooth. Place in small zip closure bag. Snip a small corner of the bag to let icing out. 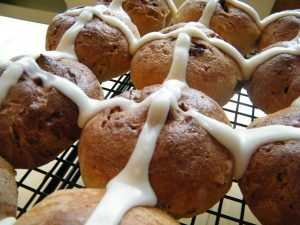 Decorate top of buns by making a cross shape in the snipped indents with the icing mixture on top of buns. 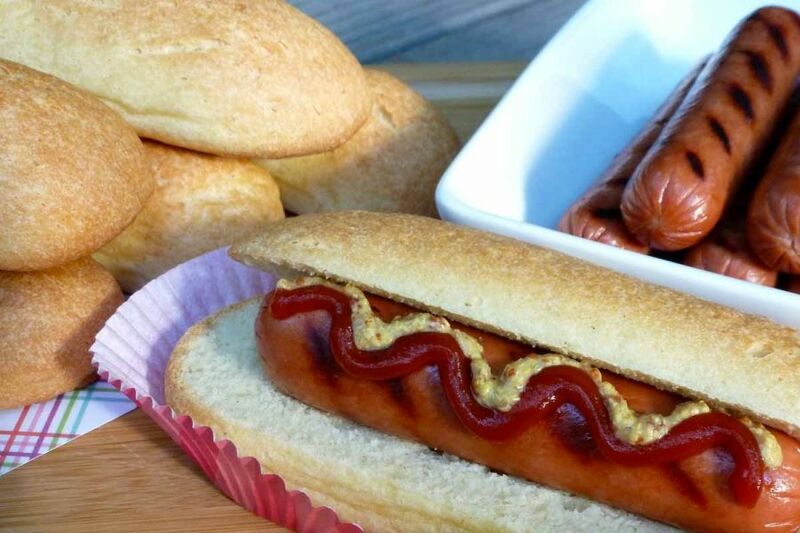 To freeze before baking: Make recipe up to shaping dough into buns, but before they rise. Place baking pan into the coldest part of the freezer. Allow to freeze solid. 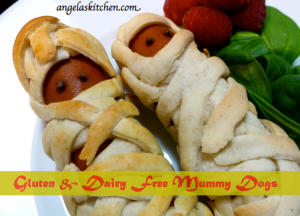 Store dough well wrapped until ready to use. 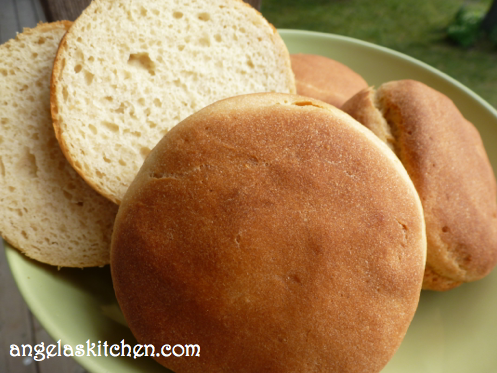 When ready to bake, place frozen buns onto silpat or parchment lined pan, cover with oiled plastic wrap and allow to thaw/raise in refrigerator overnight. Remove pan from refrigerator ½ hour before baking. 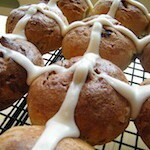 Brush with egg wash, snip cross shape, bake, etc as directed. 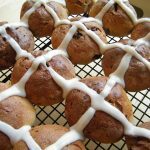 These also work well in 9×9 pans or muffin tins. Kitchen scissors are the best tool to make the cross pattern. 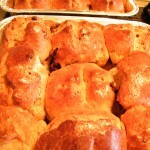 Hot cross buns all ready to eat. Okay, first of all, isn’t this picture funny, or is it just me? It’s like Dog’s Playing Poker! 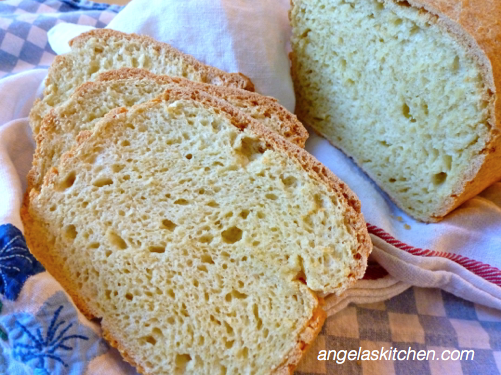 Today I am posting my version of a great bread by Carrie of Ginger Lemon Girl. 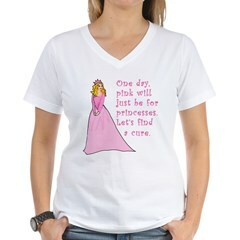 Please go and check out her sites, they are wonderful. 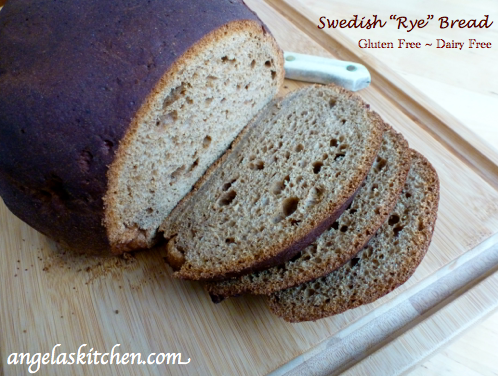 Ginger Lemon Girl is her food blog dedicated to all things gluten free. She even has a handy recipe index for you. 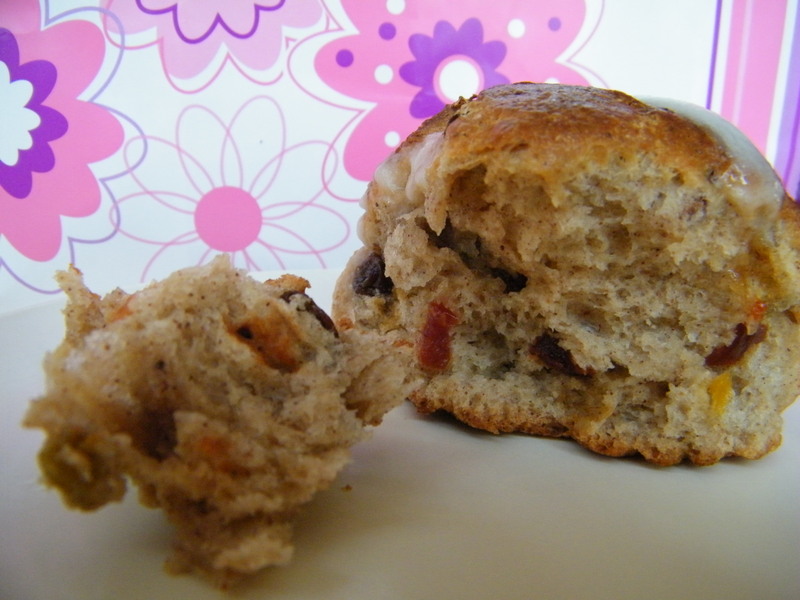 You need to try the Ginger Lemon Muffins (when I make them, I sometimes don’t share with the kids! 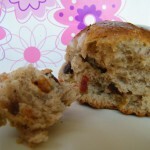 ), Apple Berry Fruit Leather, Gluten Free Bagels, not to mention last year’s Thanksgiving and Christmas Cookie roundups. Her other blog, Heart of a Servant, I also really enjoy. 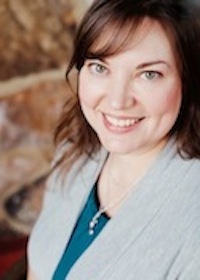 It shares more of her and her husband’s life and faith, and has some great frugal tips that we could all use. She also has instructions on how to make a Home Management Binder. Great, great tips! 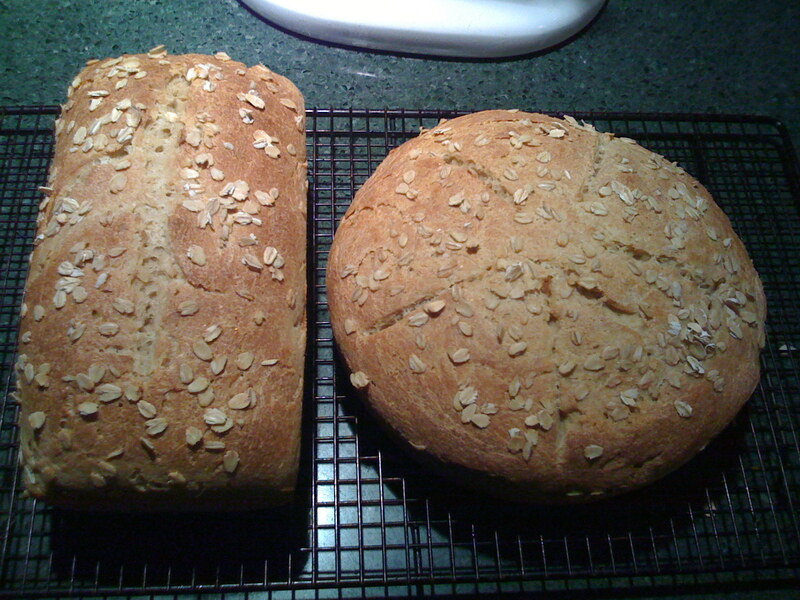 I contacted her and asked if I could post my version of her Artisan Maple Oat Bread. 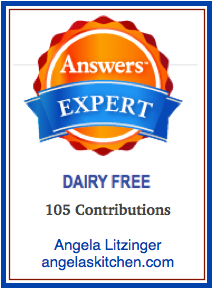 When I make it dairy free, I simply replace the 3 tablespoons melted butter with 3 tablespoons olive oil. The biggest change that I do is HOW is make it. I use a sponge and then an extended rise time to really get it to puff up. 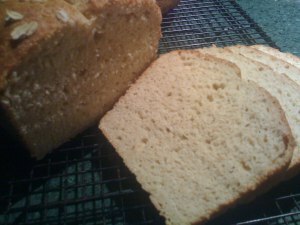 I have liked using this technique on our gluten and dairy free breads as it really seems to make a nice product that stays fresher longer, seems to stay moister longer, rises well and seems to break down and mellow any strong flavors some of our flours seem to have. Put water into a mixing bowl. Sprinkle yeast on top. Let sit 5 minutes until bubbly. Mix in honey and vinegar. 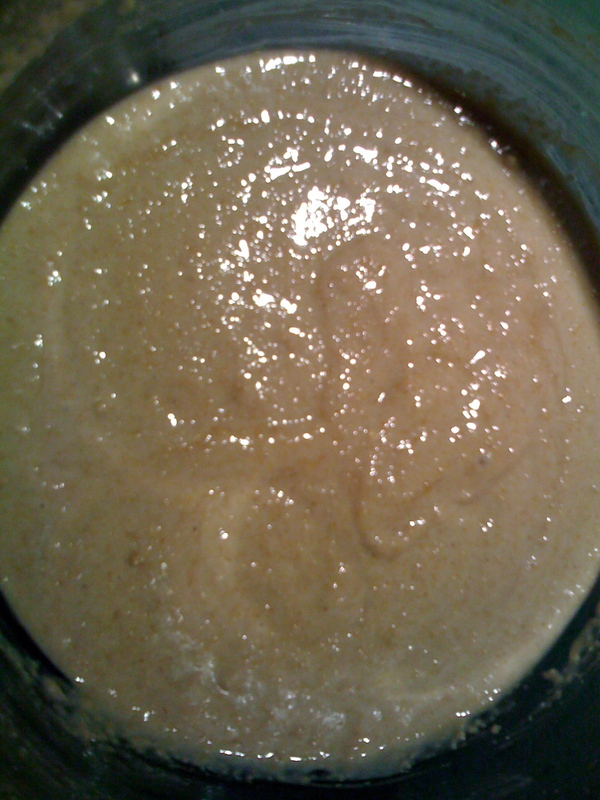 Mix in the oat flour until well blended and smooth. This will be pretty thick. Cover the bowl and allow to stand on your counter from 2 to 4 hours. When the sponge is ready (or when you are ready to deal with it), it should have bubbles throughout it. The sponge after sitting. See the bubbles? The sponge as being poured in… nice bubbles! Whisk all dry ingredients together in the bowl of your stand mixer. To your sponge add the club soda, oil, and beaten eggs. Mix thoroughly. Using a greased flexible spatula, gently scrape dough into prepared cake or bread pan and spread artistically into a large circle. Add artistic swirls if desired. Spray one side of a piece of plastic wrap with non-stick cooking spray and place loosely over dough. 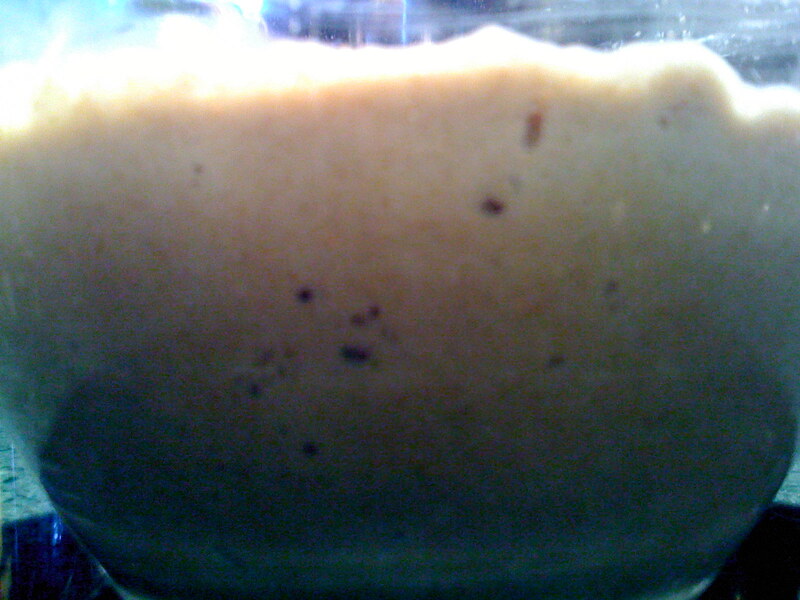 Before the dough rose (I smoothed the dough). …and after. 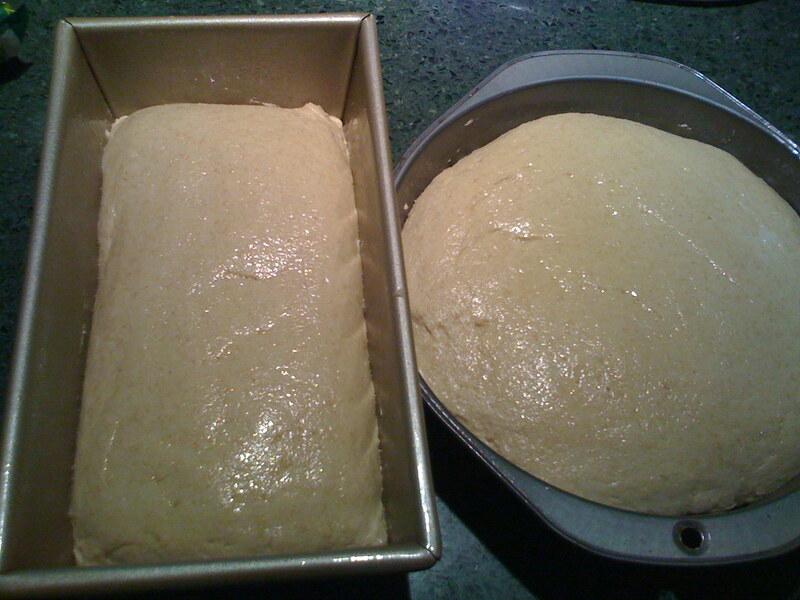 The dough is level with the top of the pan. 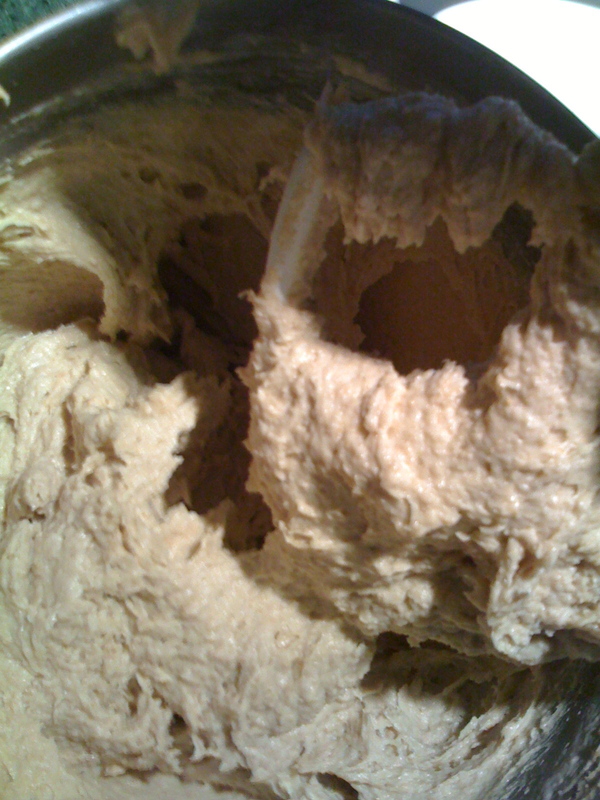 Remove dough from fridge and place on countertop still covered. Allow to sit for about 30 minutes to warm up a bit. 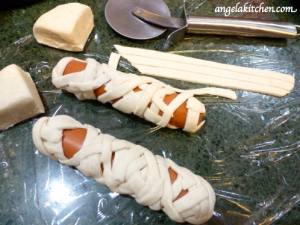 Remove plastic wrap from dough. Mix egg white and 1 tsp. 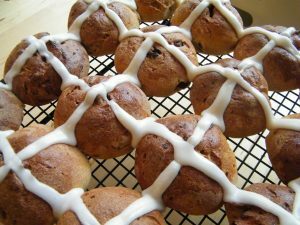 warm water together.. Gently brush over risen dough. 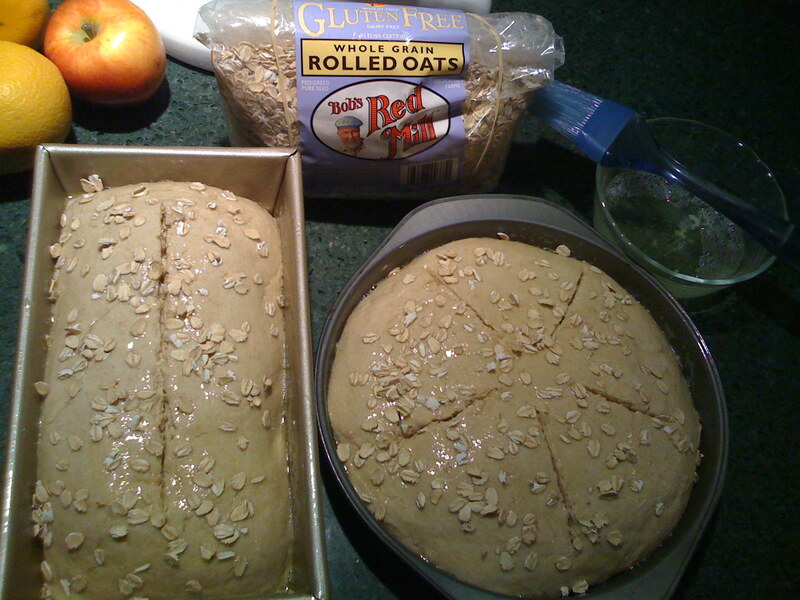 Sprinkle GF oats artistically over the top of dough. I also put slashes in mine. 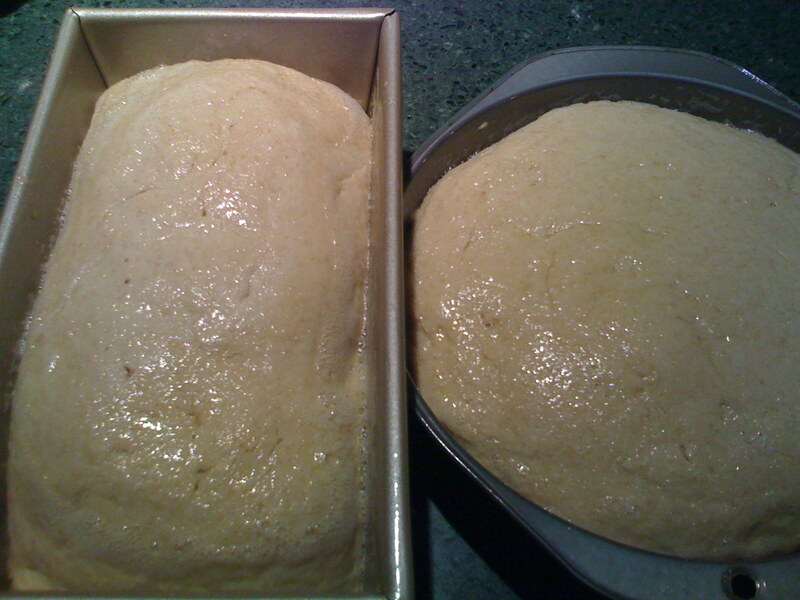 Place in preheated oven and bake for 35-40 minutes (I usually bake for about 5-10 minutes more. 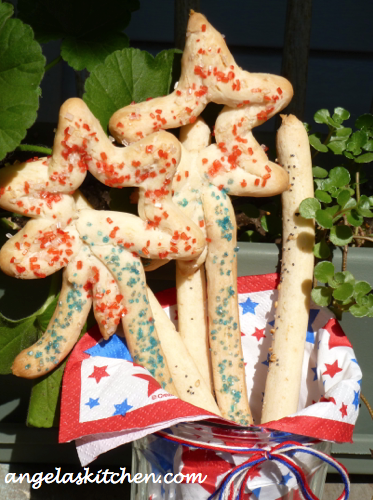 I think because of the presoaked dough) until a toothpick inserted in the middle comes out with only a few crumbs. 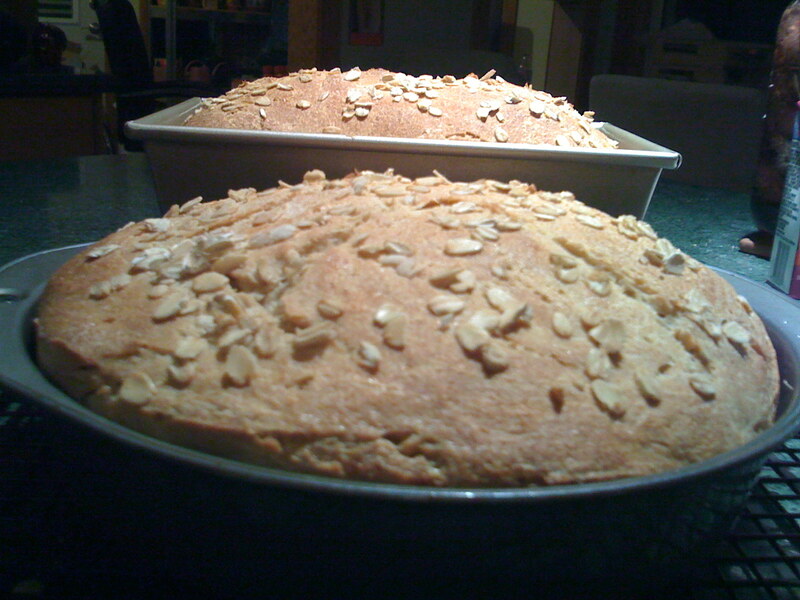 Let bread rest for 30 minutes on cooling rack before slicing. Enjoy! 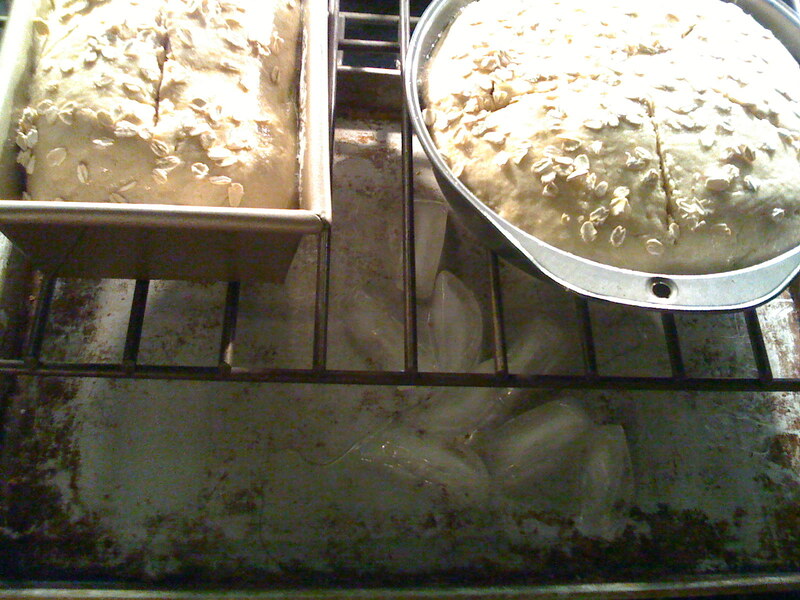 (From Angela) one more tip I have for you: If you take some ice and put it on an old baking pan you don’t mind warping, and put it in the oven (on the bottom rack) with the bread (on the rack next one up from the bottom one), you will get steam in your oven which I find eliminates the weird hard top gluten free crusts can get sometimes. Thank you, again, Carrie, for letting me share this. And thank you for helping me figure out how to have a family favorite once again. Everyone else? Head on over to Ginger Lemon Girl and find out what a gift this talented blogger is to us!